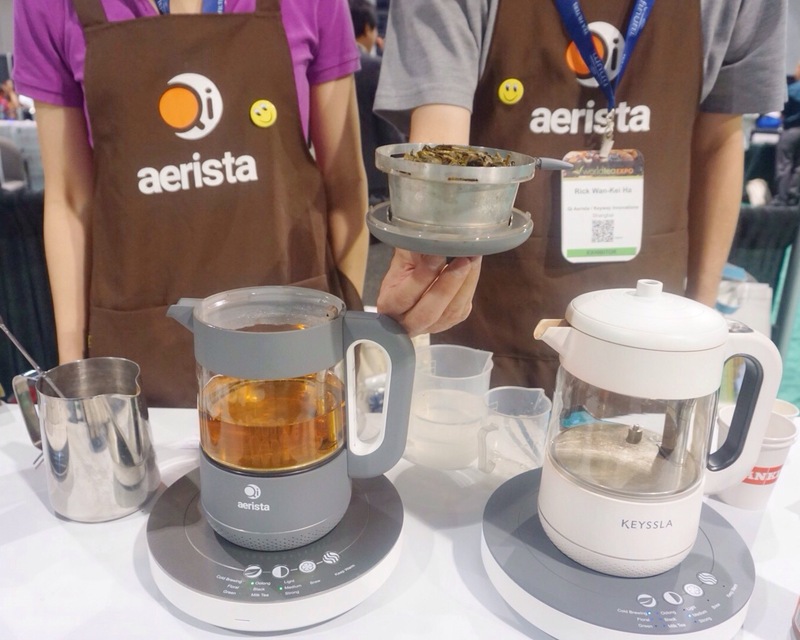 Qi Aerista- I have to admit, I loved this little tea making machine and the friendly folks behind it. It's a simple machine, with 6 presets for green, oolong, black, floral, milk tea, and cold brewing. You can also customize the brewing parameters and track everything through their phone app. The device is simple, and not too large. Similar to other tea makers such as the Breville, but this one looks a bit smaller and is a little cheaper. I don't own a Breville myself, so I asked my Blogger Roundtable friends to compare the Qi and the Breville. They do seem comparable, but the Breville has a brewing basket that lowers into the water to brew, and the Qi holds the leaves in a compartment at the top of the machine while water circulates through it. Also, the Qi can be controlled through an app, and the Breville doesn't have this functionality. The Qi water temperature settings also appear to be a bit more customizable. The price for the Qi Aerista will be about $200 (the price isn't set yet but this was the estimated price I was told) and it will be 50% off during their Kickstarter campaign. The Kickstarter will be launching in October, so do keep an eye out. They made a video with feedback from attendees of the Expo, and a few bloggers make it into the video, myself included (eeps!). 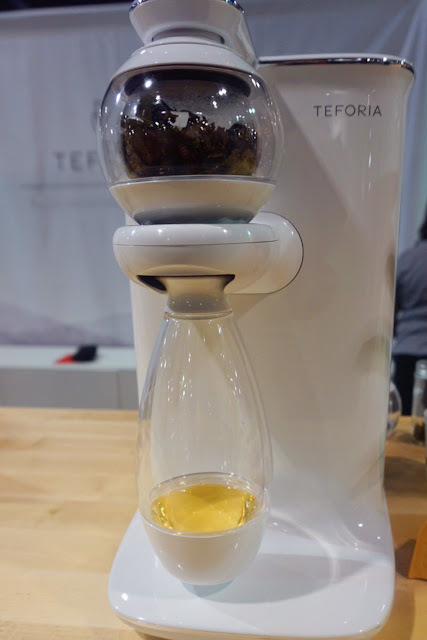 Teforia: The Teforia machine certainly looks sleek and impressive. 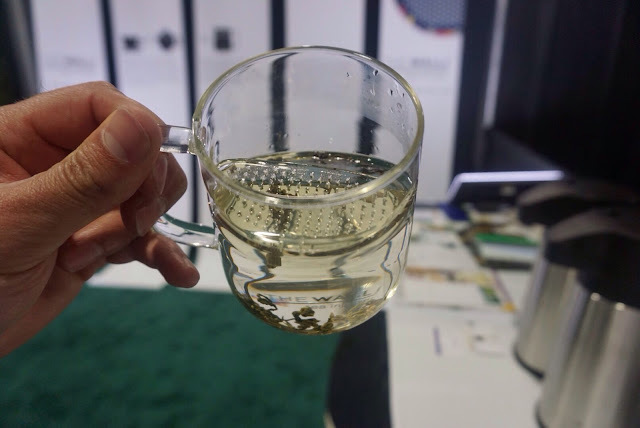 It can extract the exact flavor profile you want from your tea, and even change the caffeine level and the amount of antioxidants. It's got lots of bells and whistles. It's a well conceived device and it does make a very good cup of tea (I sampled quite a few). However, I can't say this type of machine is really for me since I don't think it's necessary to pay well over $1000 for a tea maker. I also like the ritual of slowing down and preparing a cup of tea on my own, while interacting with my leaves. At the Expo I was surprised to see all of the demo machines leaking a bit. Someone mentioned they were prototypes, so hopefully they'll get things sorted out before they start shipping them. The Wall tea steeper. This isn't a mechanical gadget, but a cleverly designed mug. Rachel Carter and I spotted this cup while walking the floor and we instantly fell in love with it. It's just a glass mug with a built in glass strainer that covers half the top, but it's good looking, and very functional. 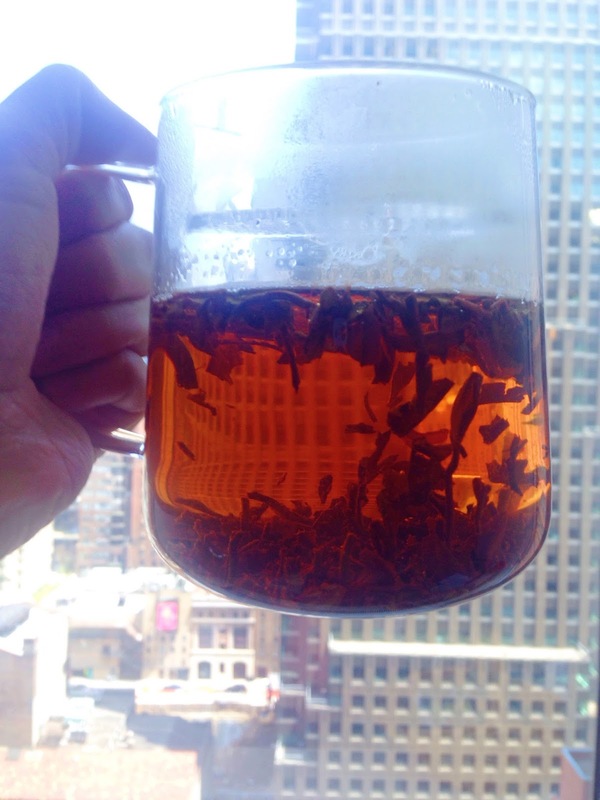 It was originally created for herbals, but it is perfect for grandpa style tea. I've been using it every day and I've been getting a lot of joy out of this mug. They come in 'large' (about 14 oz) and 'small' (about 10 ounces) sizes. I have the large, and it's a perfect size to keep in my office. The mug is large enough to get me through a long meeting with ease. I've even had a situation where the meeting went long, I finished my tea, and I was able to covertly examine the leaves while people kept talking around an issue without actually saying anything of importance. Priceless.